Remember the time I went to my first pole dancing class? If not you can read about that here. 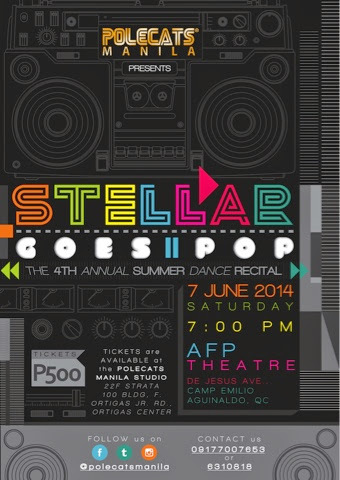 I was very happy to learn though that the company Polecats Manila, where I had my first class is now going to have their 4th Summer recital Show entitled: Stellar Goes Pop! This will be on June 07, 2014, 7PM AFP Theater, Camp Aguinaldo, Quezon City. This show will highlight and feature the students themselves which they fondly call the Pole kittens and Pole tigers.The show will feature 120 recitalists and guests doing pole, aerial silk and aerial hoop routines to pop songs from the 80s to 2000s. It will be an exhibition of art, athleticism and passion for this newly-respected artform. The show is expected to draw in an audience of 850-1000 people. So come out and watch them because it definitely will be worth it! Tickets are at Php 500 available at the event date or at 22nd Floor, Strata 100, F. Ortigas Jr. Road (formerly Emerald), Ortigas, Pasig City.